PAC organizes a number of fundraisers each year. These include Direct Drive, Clothing Drive, Shop-Funds & Popcorn Sales. 100% of the proceeds from these events are used for programming and purchases to support the learning environment of the students in the school. We encourage everyone to participate to the extend they are able. Every contribution is appreciated and everything goes to our children. Annual Direct Drive is our school’s most important fundraiser! Direct donations are an investment in our children as 100% of the proceeds to this fundraiser will go directly to all of our children. The more money we receive through direct donations, the fewer fundraisers we need to hold and the more services and events the school can provide for our children. Direct Drive makes fundraising simple; just donate. Donations $25 and over will receive charitable tax receipts for the 2019 calendar year. Our annual Direct Drive Fundraiser has supported numerous school initiatives and programs including a new primary playground, school full of Smart boards, a new iPad lab on cart, new sound system for the gym, school jerseys, gymnastics, skating, Project Chef cooking class, and Grade 7 camp. Thank you for your support in making Oppenheimer School a great place to send our kids. Every dollar counts. Every student matters. Our gift card fundraising program is a way you can help raise money for your children’s school by purchasing gift cards from dozens of retailers and restaurants. The gift cards cost exactly the same as if you bought them at a store and they do not expire. The only difference is when you buy from our program, a portion of the sales will go to the PAC for purchasing resources for the school. Shop like you normally do; just buy gift cards from our program and use them to pay for your purchases at stores, gas stations, restaurants and hotels. They also make great gifts! Shop-funds go on sale in November before the holidays, and often again in the spring. PAC organizes 2 clothing drives each year. Our charitable partner organization is DDA Developmental Disabilities Association, who gives us $ for every full bag we collect under their Cash4Clothes program. What items are accepted? Clothing, shoes, accessories (belt, scarf, tie, hat…), linen & towels (no pillows please), sleeping bags, camping & sporting gear, housewares, pot & pans, small appliances, toys – pretty much anything that is still usable and in working condition. Posters, notices and bags will be sent home closer to the time of the clothing drive. On the clothing drive days, simply leave your full bags outside your child’s classroom along the wall in the morning. The clothing drive raises funds to support our school activities that directly benefit each student. The more bags you bring equals more funds raised. Please hold on to your unwanted items and donate it at our Clothing Drive. 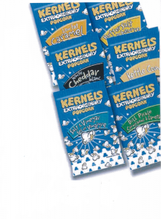 Every month, Kernels popcorn are available for purchase. It's a nice little snack treat that kids love, and makes a fun and yummy fundraiser for the school.